One of my favorite memories from my son's early weeks is making him into a "baby burrito" as we liked to call him. It was so cute and was one of the only things that could get him to settle down and get ready to sleep at night without crying! I was all ready this time around with my daughter and had a selection of swaddles on hand! However, because my daughter was born MUCH smaller than my son and didn't grow as fast, none of the swaddles fit her...until we received the awesome Woombie!! It fits so snugly and makes my daughter really feel cozy and warm like she was used to in the womb! I really trust the Woombie because it was designed by a RN & Certified Infant Care Specialist, providing the safest and most comfortable swaddle for your baby. Gently hugging the shoulders, tummy and hips, the Woombie allows for natural movement, softly cocooning your baby without restricting mobility or development. The Woombie has been shown to promote a more natural and peaceful sleep environment for infants resulting in longer periods of sleep with less restlessness- which is why Infant Care Experts recommend the Woombie to institute successful sleep patterns from birth to 6 months. One of the biggest reasons I like the The Woombie is because it prevents my daughter from scratching her face! She loves to have her hands by her face and I hate to see the big scratches she creates! The Woombie gently holds her arms to her side without completely restricting them! She likes to move around a little when she sleeps so the Woombie is perfect by allowing her to put her arms where she wants them - just like in the womb! I absolutely LOVE that they offer an ORGANIC Woombie! That is so important to me, especially in the early days with their super sensitive skin, to only put organic material on her body and skin. Their skin absorbs EVERYTHING and I only want safe, organic cotton near her skin at this time! My daughter loved to be swaddled in her Woombie and I love that it is so EASY to put on! No velcro to scratch her or loosen up in the night (like some of our other swaddles) and the zipper makes it SO easy to put on even when she is crying and moving around! It has a two way zipper which it makes it so easy to change her in the middle of the night! I never worry about her overheating or not being warm enough at night with her breathable Woombie on and she doesn't wake herself up by startling anymore! 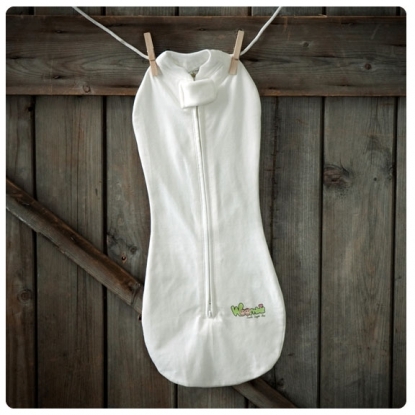 If you are looking for a swaddle but don't want to mess with velcro, directions every time you use it, or figuring out how a swaddle goes on while your baby is screaming, then you have got to get the Woombie! It is by far the easiest swaddle I have ever used! They really have thought of everything with the Woombie! Buy It: You can purchase the Organic Woombie for $28.99 on the Woombie website. Win It: Woombie is generously offering (1) Original Woombie (in color of your choice!) to a lucky winner!